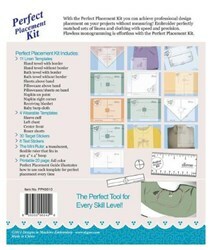 • Precisely position designs on napkins, towels, shirt cuffs, left chest and more. • Professional results with minimal effort. Ever feel overwhelmed by what should be a simple embroidery task? Stitching one...two... a dozen or 100 embroidery blanks like towels, t-shirts, shirt cuffs or napkins can be a daunting task without the right tools. Designs in Machine Embroidery has a smart solution! 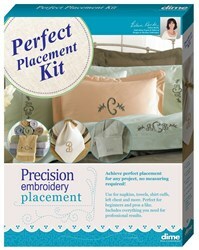 The Perfect Placement Kit includes 15 reusable plastic templates for the most common blank items you want to embroider. Simply place a target sticker in the designated spot according to the template and you're just a stitch away from embroidery success! No more guesswork or tedious measuring is required. 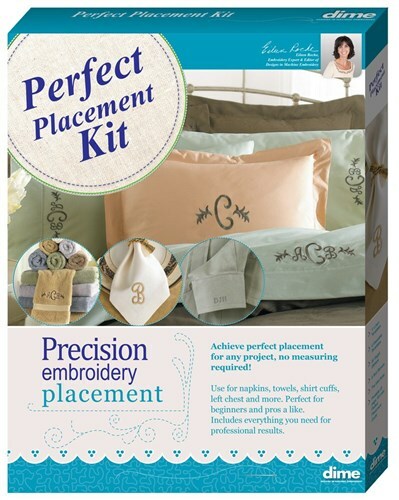 With the Perfect Placement Kit it’s easy to achieve perfect placement on almost everything - napkins, towels, shirt cuffs, left chest and more with speed and precision.